All the sudden new companies are popping up – particularly those who are Orlando stroller rental companies. The thing is while adding strollers to your rentals – like we did recently and quietly (to start with a slow roll out) at the behest of our customers, it is a lot more complicated to rent a device that has a motor and batteries rather than something you just push a lightweight child in. From experience I can tell you trouble shooting a scooter issue or worse yet having to swap a scooter due to mechanical failure inside a park is a lot different service that a stroller you can pretty much pick up and carry. There is always someone new who thinks “oh I can do that”. What we have seen year in and out, over a decade of business, is they usually end up learning it is not so easy and they can’t fix the scooters without a trained mechanic and/or engineer or end up with many mad customers and a bad reputation and they go out of business. The image here is from a Disney “preferred”stroller rental company new scooter rental website (preferred means they pay Disney to leave strollers with the bellman) . They recently launched into scooter rental. I almost fell off my chair when I read that. WHAT? Clearly you cannot understand the needs of a person who rents a scooter if you think this would be acceptable. 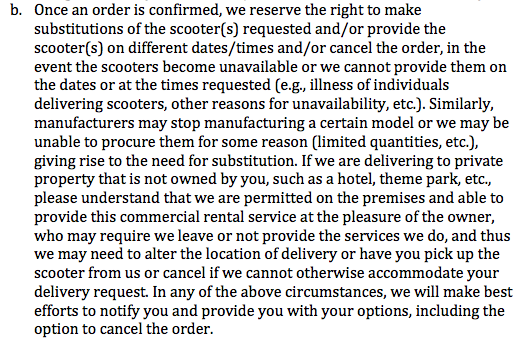 What really was crazy is they promote how other scooter companies don’t care about the person they are delivering to or providing on-time delivery. They “Guarantee” On-Time Delivery (which seems contradictory to them being able to cancel or deliver on different dates) but they do not put their “Guarantee” in writing on the website. They just say “ask us about it”. Scooter maintenance takes a seasoned, not only mechanic, but also engineer. In the US, Medicare is the largest purchasers of mobility scooters a.k.a. ECVs. The specifications are for INDOOR use! Yes, INDOOR! 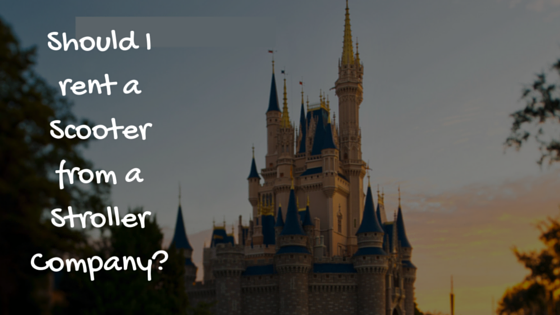 And I don’t know anyone that has a house as big as a theme park nor has to deal with rain or the hot blaring sun. We spend an enormous amount of time selecting scooter models where we can provide larger batteries, have a headlight, install our own water-resistent keys, and even reverse the drive mechanism should we have a customer that needs to use their left rather than right hand. This is so much more than a stroller rental. The most terrifying thing will be the customers who rent from an inexperienced scooter rental company. When you are spending over $100 plus a day to go to a theme park, the last thing you need is your scooter rental “substituted”, “different dates” (What? When you are not there maybe? Really?) or “cancelled” due to “illness of individuals delivering scooters”. But what about their GUARANTEED ON-TIME DELIVERY? As I am sure those of you know that at Scooter Vacations if a driver doesn’t show or is ill…guess who gets in the truck to deliver? Yup. the managers and owners. As owners we have even had to take our two children out (when they were too young to stay by themselves) to deliver or do a repair swap. As a business owner you do what it takes, no matter the day or time. We sit by the back-door at church during Sunday service in case there are too many calls coming in at once and they overflow. I pray God understands as we must take care of those who we have committed to serve and our customers are definitely deserving of us doing our best. With the parks being much busier this year, book early and check the reputation and that the company has been in business (providing scooter rental) for a long time – oh and double check what they put in writing. Scoot Orlando is the best! So professional and caring. Thanks for making my vacation great!